Transactions allow you to move money between accounts. This includes absolutely everything from incomes, money transfer between accounts to expenses. Transaction panel only displays one month transactions at once, current month by default. You can easily navigate through months or years using right and left arrows or selecting the month from the month pull-down menu and entering year. Payee/Issuing: Transaction Payee/Issuing name - This entry is linked to the pull-down menu on the right so you can easily select existing payees or add new ones. Project: A project is a label that allows you to mark related transactions and perform queries using that label. You could for example mark a group of transactions as 'Home improvements' and then use the query panel to display them all. Rates: In case you are transferring money using different currencies. The first rate field is for setting the exchange rate between Origin and Target accounts. The second rate is for setting the exchange rate between the Origin account and the default rate. iCash always needs the exchange rate between the transaction rate and the default rate in order to show categories and types computed totals. 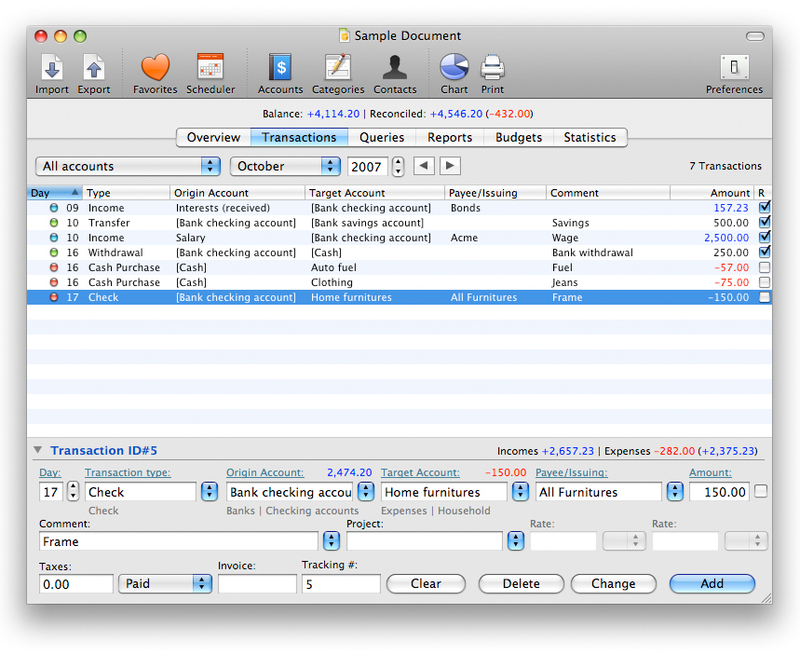 Taxes: Taxes applied to the transaction - This entry is linked to the pull-down menu on the right in order to select tax type. Tracking number: A custom number to link the transaction to paper documents. Transaction type names are fixed and can't be edited however you can type a transaction type first characters to get it selected and add custom data like a check number, ATM reference or whatever you need. A transaction type get selected once its name is displayed below the transaction type field. 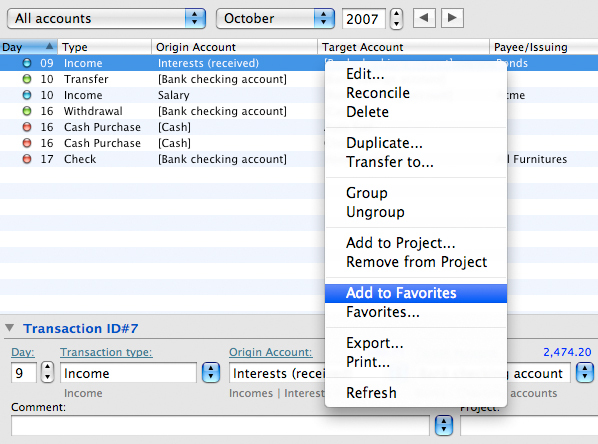 Origin Account pull-down menu shows Banks and Incomes accounts by default. Target Account pull-down menu shows everything but incomes accounts by default. Both menus can display all accounts selecting the 'Show All Accounts' menu. When selecting the Origin and Target accounts from pull-down menus, iCash displays current balance on the upper right account field side. Adding a transaction is just a matter of setting the transaction data using available controls and clicking on the Add button. Note that a transaction can't have the same Origin and Target accounts. By selecting the origin and target accounts all other fields will be set automatically using the data from the very last transaction of the same kind (You can deactivate transaction auto-completion if needed from the preferences). 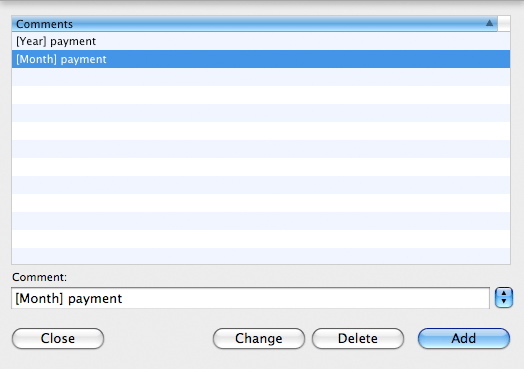 You can clear the transaction entry fields at any time using Edit | Clear menu. Changing a transaction is as simple as selecting a transaction from the list, changing the data using transaction controls and pressing the Change button. Note that you will have to confirm on reconciled transactions. Deleting a transaction is just a matter of selecting the transaction from the list and pressing the Delete button. Note that reconciled transactions can't be deleted. They have to be unreconciled first. 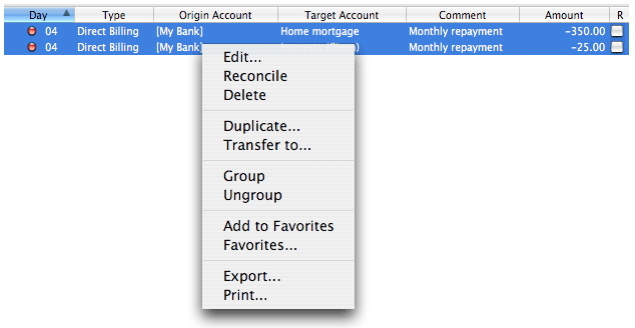 Once grouped transactions appear as a single one on screen you can reconcile with your bank statement. You can see the detail (split) pressing the disclosure triangle on first column. The comment editor: You can use the comment editor to create default comments to be used with your transactions. Comments can include tags. Those tags are automatically replaced with corresponding data. Available tags are: 'Year', 'Month', 'Day', 'Short Date', 'Long Date' and 'ID'. For example '[Month] payment' will be replaced with 'April Payment' on April. 'ID' stands for transaction number. Transaction breakdown: iCash lets you add more data to your transactions. To do so just double-click any given transactions from the list to be shown with the transaction details window. 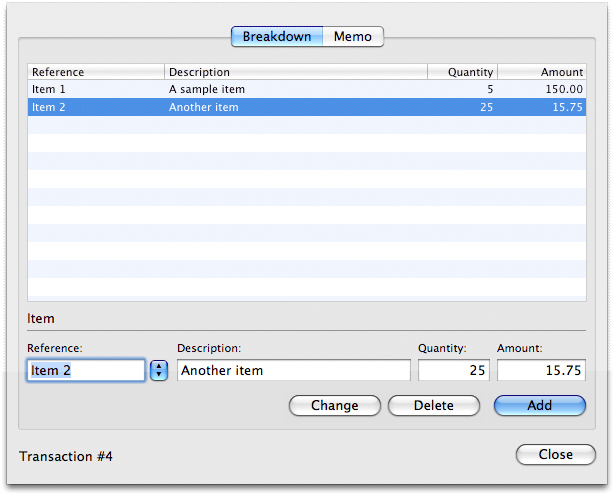 You can then add the transaction breakdown and a memo. An item editor is also included. Duplicating and transferring transactions: Transactions can be duplicated and transfered very easily. Duplication is intended to use existing transactions taking advantage of most of the information they contain. 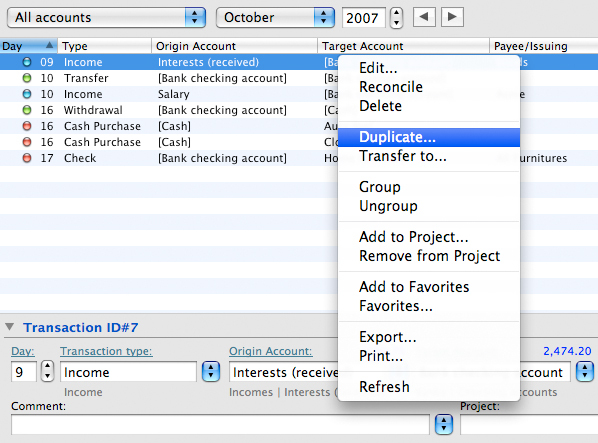 Transfer is similar but move the transaction to a different date rather than duplicating. To transfer or duplicate transactions just select them from the transaction or the query panel, and either control-click to access the contextual menu or select 'Transaction ı Duplicate...' or 'Transaction ı Transfer to...' main menu. 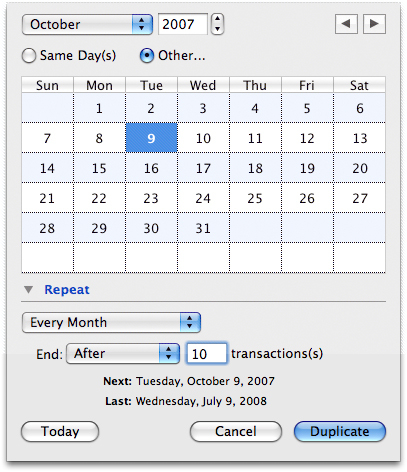 A calendar window is then displayed in order to let you select the target date the transactions have to be duplicated or transfered to. Select 'Same Day(s)' to keep original transactions day or 'Other' to select a specific day. You can move between months using the left and right buttons, select a specific month from the pull-down list or choose a different year. When you are ready click on the Duplicate or Transfer button. 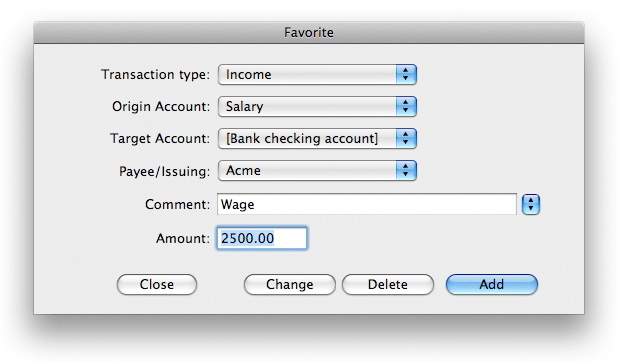 Recording transactions: iCash lets you record the transactions you use more often as Favorites. As simple as selecting a transaction, pressing your mouse right button and selecting the 'Add to Favorites' menu or 'Transaction ı Add to Favorites' from the main menu. 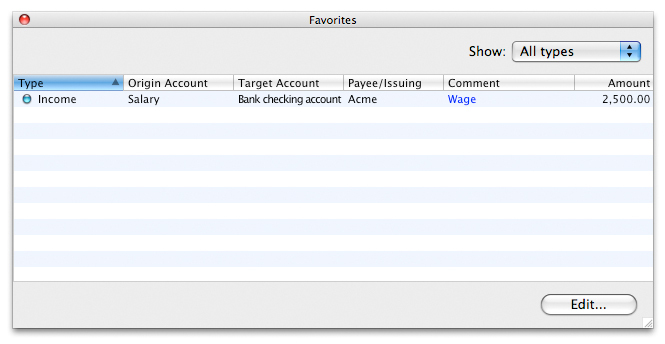 You can see check that your transaction has been recorded recorded by opening the Favorites window (selecting the 'Favorites...' menu from both contextual and transaction menus). You can set the list to display all transaction types or a particular type using the types pull-down menu on the upper right corner. To use a transaction, select it from the list and click on the 'Select' button or just double-click it on the list. The window is closed and favorite is copied to the transaction entry fields. Favorites can be edited to match your requirements, but also deleted or created from scratch by selecting a favorite from the list and clicking on the 'Edit...' button. Adding and editing contacts: iCash includes a Contact database you can use to set transaction's payee or issuing. 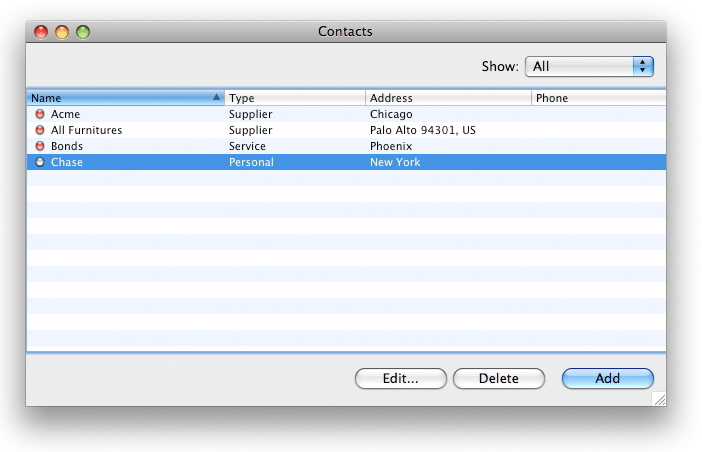 Contacts are created automatically as soon as you use them for the first time. You can access the contact editor from both the transaction Payee/Issuing field or the Transaction | Contacts menu. 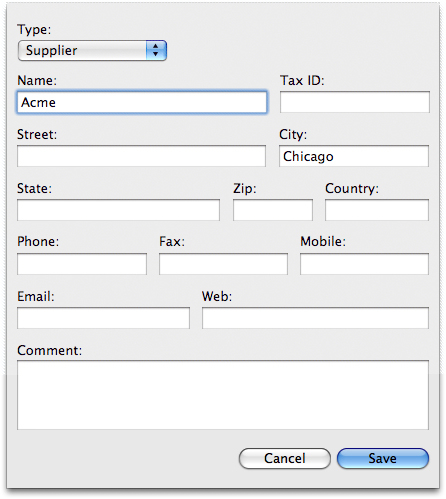 Contact panel includes all the required data for the transaction payee/issuing field. Contacts can be be categorized as 'Personal', 'Customers', 'Suppliers', 'Employees', 'Employers' and 'Service. Only 'Name' field is required. Note that you can't delete a contact if it has been used in at least one transaction.